With July upon us, summer is finally in full swing, and when these hot, sunny days have you feeling the urge to hit the pavement – get out and have some fun – you can rely on plenty of mobile devices to bring the entertainment along with you. Obviously, that means bringing along your smartphone, but to get the most out of an impromptu summer cookout or lazy afternoon at the pool, you're going to want to share some of that entertainment with all your friends – and who wants to spend that time huddled around a handset? 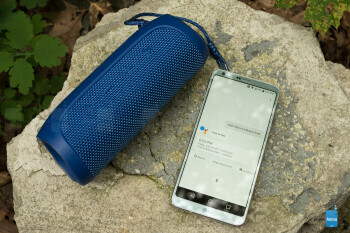 Instead, you're probably thinking about pairing your _phone_ with a versatile, outdoor-friendly speaker, letting you play DJ and share your favorite new tracks with everyone within earshot. There are plenty of options for doing so, but when it comes to feature sets best suited for summer listening, the JBL Flip 4 caught our eye. 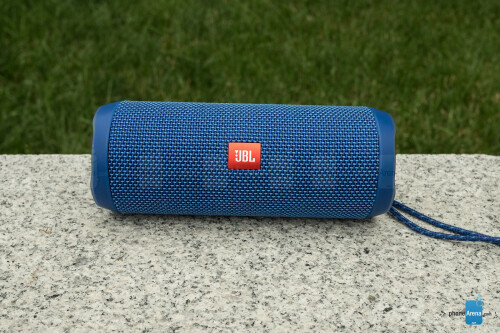 Promising waterproof operation, a rugged, rubberized build, and the ability to deliver hours and hours of party-fueling tunes, the JBL Flip 4 sure looks like it hits all the notes we're looking for. 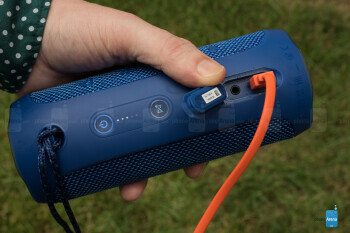 Does the portable speaker meet all its potential? Let's check it out. While there's any number of designs a mobile Bluetooth speaker can take, it feels like the majority of them go the “tube” or the “brick” route. And here, JBL wholeheartedly embraces the former with the cylindrical Flip 4. The hefty speaker is a mix of molded plastic and an expansive fabric-covered grille. While the whole design is largely monochromatic, the Flip 4 is available in a decent variety of colors, including some bold, fun-looking shades. Each end of the tube is populated by a passive bass radiator, recessed to help avoid accidental damage. They still feel a little exposed, but it's fun watching them pulse and twitch to the beat. Around front we don't see much a prominently centered JBL logo, but behind the fabric weave on each side hide the speaker's 40mm drivers. Up top we find the primary controls, a set of four raised buttons: Bluetooth, volume up and down, and a multi-feature play key. Tucked a little further back behind is the Flip 4's power button with battery-charge indicator right next to it. 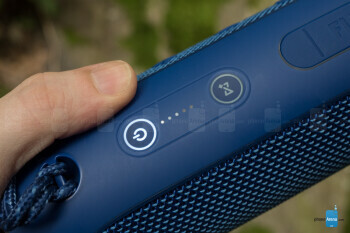 There's also an initially mysterious hourglass-looking button that turns out to help control multi-speaker JBL Connect+ functionality, which we'll discuss in a bit. A deep rubber flap conceals the micro-USB charging port and analog 1/8-inch port for accepting non-Bluetooth audio sources – and as you pop that flap open, it becomes pretty clear you're compromising the speaker's water-resistance in the process. And finally, there's a lanyard loop to ease in carrying the Flip 4 around. That water-resistance comes in the form of an IPX7 rating, meaning the speaker can withstand immersion in up to one meter of water. 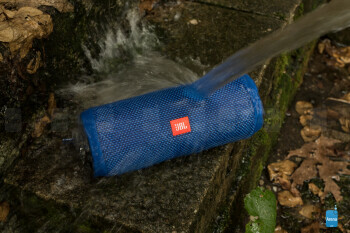 Officially, that's nice clean freshwater, but JBL says that the Flip 4 should withstand a dip in a salt or chlorine-treated pool, though recommends washing the speaker in fresh water after. Also keep in mind: while the Flip 4 is indeed waterproof, it won't float, so you're going to want to keep an eye on it around deep water. A Bluetooth speaker doesn't always need its own app – and sometimes even when the manufacturer goes to the trouble of delivering one, it doesn't do much to add value to the listening experience. Well, while JBL very much has an app for the Flip 4, this one thankfully has some real functionality to it. 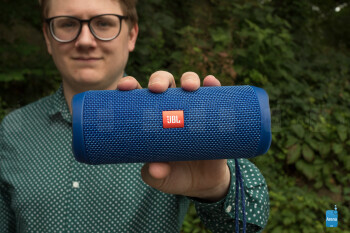 Now, you can use the JBL Flip 4 just like a generic Bluetooth speaker, and doing so couldn't be easier: hit the big button shaped like the Bluetooth rune, and pair on your phone. That will give you music playback, as well as volume and playback controls. All pretty standard, right? So what's the app for? 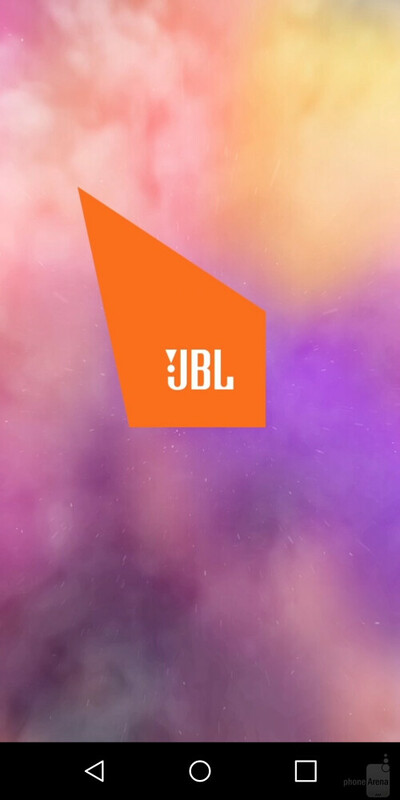 Well, once you download and install JBL Connect, you'll gain access to three additional features for the speaker. Maybe the most useful there is the ability to set up access to a voice assistant like Siri (on iOS) or Google Now. Normally, the arrow-shaped play button on the speaker acts as a pause/play button when pressed, or to advance to the next tract when you press-and-hold. But once you set up your voice assistant in the app, that single-press action instead pauses the music and lets you perform voice actions. That's pretty cool, but we have a few issues with the implementation. For one, the audio quality (we tested with Google Now) of the voice assistance is noticeably lower than that of the music – it sounds almost like you're hearing it over a _phone_ line. It's also quite a bit quieter than music, and while that might be nice if you wanted to do a quick voice search without everyone in the room hearing, we wish there were controls to set the volume to our tastes. There's also the issue that you lose the ability to pause music in this mode. While that's clearly a concession to the number of available hardware buttons on the Flip 4, why not link the voice assistant feature to a button that's not routinely used during listening – like the Bluetooth pairing button? That way you could still easily pause things at your discretion. 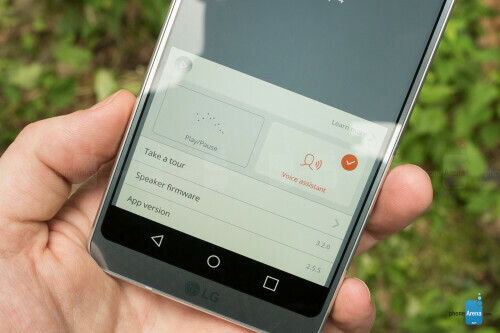 JBL's app also opens up two special modes for users with multiple speakers. Remember that hourglass-shaped JBL Connect+ button on the speaker's back? With the help of the app, you can press that button to tie the outputs of multiple speakers together. In one mode, you can chain together a whole mess of speakers (up to 100), all cranking out the same tunes. In the other, you can create an expanded stereo effect by taking two speakers, and dedicating one to the left channel, and the other to the right. 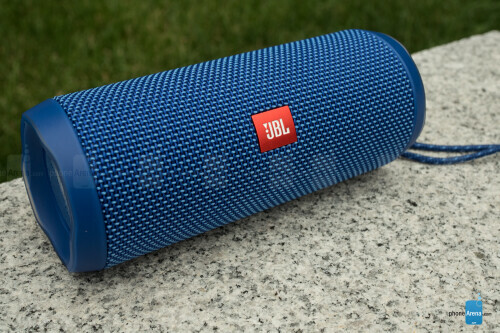 We weren't able to check out either of those capabilities (thanks to only having one JBL Flip 4 for this review), but it's worth noting that the JBL Connect+ feature they rely on is new to the company's speakers, and won't work with older models. In addition to working with voice assistants, the microphone JBL gives the Flip 4 lets you use the unit as a speakerphone. Sound quality's really not bad, but you're still going to want to keep relatively close to the speaker in order to be as intelligible as possible to the party on the other end. 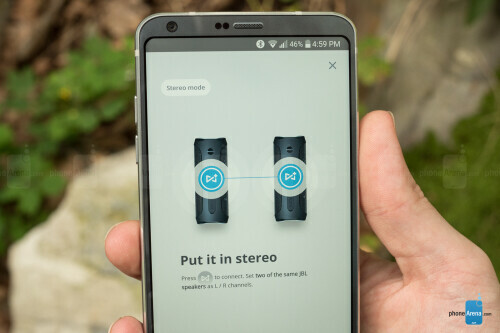 Instead, you're probably thinking about pairing your phone with a versatile, outdoor-friendly speaker, letting you play DJ and share your favorite new tracks with everyone within earshot. 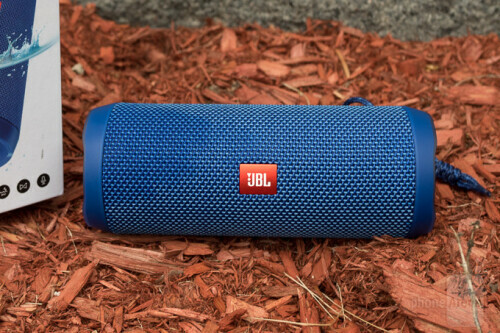 There are plenty of options for doing so, but when it comes to feature sets best suited for summer listening, the JBL Flip 4 caught our eye. That's pretty cool, but we have a few issues with the implementation. For one, the audio quality (we tested with Google Now) of the voice assistance is noticeably lower than that of the music – it sounds almost like you're hearing it over a phone line. It's also quite a bit quieter than music, and while that might be nice if you wanted to do a quick voice search without everyone in the room hearing, we wish there were controls to set the volume to our tastes. We've already touched on the basic controls of the Flip 4, but to reiterate, you've got independent up and down volume buttons, a Bluetooth button for pairing, and a “play” button that can either pause audio when pressed or trigger the phone's voice assistant, and that advances tracks when held down – there's no similar control for going back a track. On the back edge, the power button lets users turn the Flip 4 on and off, accompanied by a rising or falling-pitch sound effect. 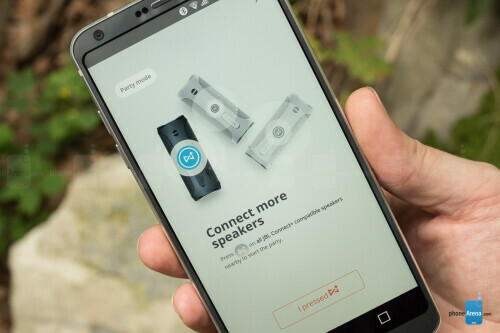 And the dedicated JBL Connect+ button is used in tandem with the app of the same name to enable multi-speaker playback modes. The Flip 4 may not have the best hardware in the world, but it still manages to deliver some satisfying sound. It's relatively easy to make a large speaker sound good, but when you're trying to keep things compact, that gets tricky; less room makes it harder to implement a bass reflex system, as well as makes stereo separation difficult to achieve. 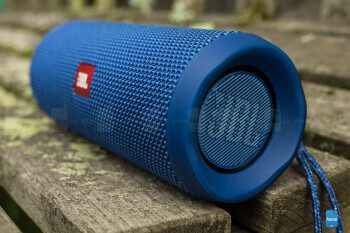 Those considerations in mind, the JBL Flip 4 manages to sound quite nice. The lack of a dedicated woofer limits bass output, but it's still quite reasonable at most volume levels. As you crank things up to max, though, those low frequencies really start to suffer, but that's only at the upper end of the Flip 4's output. Smart speaker placement, using the environment to help reflect and channel the sound, can also help a bit, but even out on its own, the Flip 4 still doesn't sound bad. Outdoors, it's got the power it needs to entertain at a backyard BBQ, though it does tend to sound better indoors. One really great spot for the speaker is taking advantage of its water resistance and putting in the shower; just like you sound better when you sing in the shower, those reverberations help get the most out of the Flip 4. The combination of a big battery and tools for easy charge monitoring are a win for JBL. 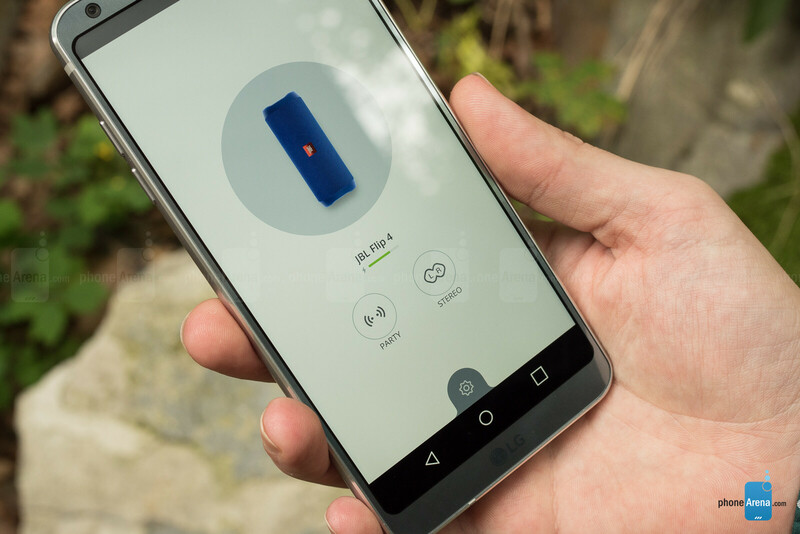 JBL gives the Flip 4 a 3,000mAh battery, comparable to the size we find in many smartphones. That kind of power can support the speaker running for up to 12 hours, though operation at high volume levels with take its toll on that maximum. In order to help you keep an eye on battery life, the Flip 4 has a built-in LED power readout next to the power button. It doesn't stay illuminated all the time, but when you power the speaker on, they'll light up for a few seconds to indicate remaining charge. That's really nice, and not always a feature we see on Bluetooth speakers, letting you keep ahead of recharge events; who wants to get a heads-up they've only got 10% charge left right before a big party? The other extras, falling under the JBL Connect+ banner are a little less appealing, but only because they require making an investment in several Flip 4 speakers before you can take advantage of them; if you've got a whole swarm of these guys, we imagine they're great features to have, but can't see a lot of shoppers picking up additional units just to try them out. Priced at around $100, the Flip 4 is a lot more affordable that competition like the Beats Pill+, but is admittedly a bit less full-featured than that model, lacking distinct woofers and tweeters. Still, for the money the performance here is in the right neighborhood, and the robust construction will let you feel confident about using the Flip 4 in all manner of environments. Perfect speaker for summer? Well, we've still got some other competition to check out, but the JBL Flip 4 is definitely a strong contender.